What are some of the best-known comets of modern times? Halley’s comet is probably the best-known comet in human history. It last flew by Earth in 1986. 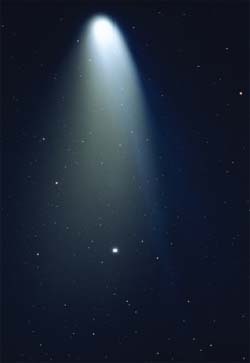 Other well-known comets in recent times include Comet Shoemaker-Levy 9, which broke apart and crashed into Jupiter in 1994; Comet Hyakutake, which flew by Earth in 1996; Comet Hale-Bopp, considered by many to be the “comet of the twentieth century,” which flew by Earth in 1997; and Comet McNaught, which in early 2007 was visible even in the daytime. The Hale-Bopp comet passed near Earth in 1997.